A01 body in the white color scheme is available for $170 with free shipping and a 90-day Olympus USA warranty. It is in-stock as of the time of writing. Since our post in the morning, a few of the times sold-out, but a few more got added. Now there are 20 items listed there. The new condition Olympus E-M1 II body only goes for $1800 at authorized dealers such as Adorama and B&H Photo and Amazon itself. But if you want to save some, off to the Olympus USA Outlet store we go, where coupon code GREENMONDAY gets you the refurbished Olympus E-M1 II body for $1500 with free shipping and a 90-day Olympus USA warranty. The coupon drops the price from $1700 to $1500. One more thing from the Olympus Outlet store coupon CYBERSAVINGS. It drops the price of everything there by 20% with the exception of the refurbished Olympus E-M1 II body which drops from $1700 to $1500 when you use the promo code CYBERSAVINGS until 11:59pm ET on Monday. You get a 90-day Olympus USA warranty. In new condition, this is going for $1700 at authorized Olympus USA dealers such as Amazon and Adorama and B&H Photo. The last two offer 4% promotional rewards, that’s $68~ to be used in future purchases at those stores. On the PRO side of things in the Olympus Outlet Store you get 20% off with coupon code CYBERSAVINGS on the Olympus E-M5 II PRO KIT listing which goes for $3440 before coupon. Entering the coupon in the shopping cart (you don’t have to sign-in or sign-up to enter/test the coupon), drops the price of $2752 with free shipping and a 90-day Olympus USA warranty. The sale ends on actual Cyber Monday at 11:59pm ET. So you are paying $1660 less than the new condition prices! A system switch temptation? A stock up purchase? Here it is! Cyber Monday coupon CYBERSAVINGS a total of eighteen refurbished Olympus items in the Olympus Outlet store. Now before you buy, make sure you compare the prices to the new condition versions of those lenses and cameras, some of which are heavily discounted in the Olympus Instant Savings. As teased in the Olympus Black Friday Teasers, the new condition Olympus E-M1 II, the current flagship of the Olympus side of Micro Four Thirds is down $100, at an all time low of $1700 with free shipping at Adorama and B&H Photo and Amazon itself. The prices of the other kits are appropriately adjust as well. Some people use pens to write with ink, others use them to write with light. If you are of the latter persuasion, the manufacturer refurbished Olympus PEN-F (black) is back in-stock for $700 with free shipping and a 90-day USA warranty at the Olympus USA Outlet Store. At the moment, in new condition at authorized dealers it goes for $1000, such as B&H Photo and Amazon itself. In new condition, this goes for $550 at authorized dealers such as Adorama and B&H Photo and $650 with the 14-42 or $750 with the 12-50. This was the price of the body only two weeks ago as well when I posted the Mirrorless Price Charts. If you prefer the refurbished E-M10 II with the 14-42mm EZ, it goes for $430 in black or silver at the Olympus Outlet store, which is exactly the price of the refurbished 14-42mm EZ lens on its own. So if you go refurbished, the delta between the body only and the “with 14-42 EZ” is +$150, while in new condition is +$100. 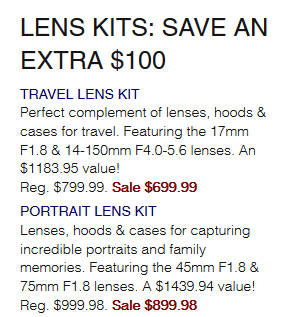 In other words, if you don’t feel compelled to have the 14-42 EZ lens, you can also look into getting a different lens, for example, a $90 pancake. The first generation Olympus E-M10 is no longer available in new condition at authorized dealers. Olympus already revealed the third generation (E-M10 III), one among the 12 new mirrorless new cameras of 2017. This is a breaking news alert! The Olympus USA Outlet Store has been refilled! Thirteen new items have been added since I checked earlier today! Sunday is here and with it a new round of Olympus Instant Savings! Their current flagship, the E-M1 II body only is now down from $2000 to $1800 at B&H Photo where it also earns 4% promotional rewards (around $72 to be used in future B&H purchases). The discounting also propagated to the E-M1 II with 12-40mm f2.8 currently going for $2498 with free shipping, and at the same time, the E-M1 II with 12-40mm and 40-150mm f2.8s go for $3798 with free expedited shipping. On the E-M5 II front, the E-M5 II body only in silver or black, goes for $799 with free shipping and 4% promotional rewards ($32~ to be used in future B&H purchases). 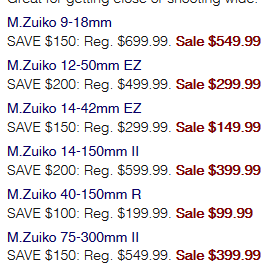 The discounts are propagating to the “with lens’ kits, the E-M5 II with 12-40 f2.8 goes for $1498 in either color scheme. All four official Olympus kits for their new E-M10 III micro four thirds mirrorless camera are now in-stock at B&H Photo at their normal prices of $650 (body only) or $800 (with 14-42 EZ) in the silver or black color schemes. 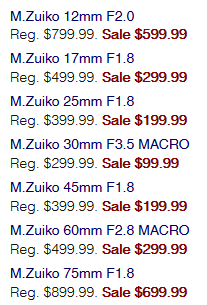 On the other hand, if you prefer the previous generation models or their price-ranges, you might as well go manufacturer refurbished at the Olympus USA outlet store where the manufacturer refurbished E-M10 II body goes for $300, or with the 14-42mm EZ for $430. These come with a 90-day warranty from Olympus USA. The “smartphonization” of digital cameras (the addition of smartphone-like features, Wifi, touchscreens, NFC, companion apps, syncing, etc) has the added benefits to manufacturers of encouraging photographers to follow the upgrade cycles, similar to the smartphone upgrade cycles. With that master of the obvious generalization out of the way, we have a new in-stock alert! The recently revealed [see New Cameras of 2017] Olympus E-M10 III body only is now in-stock and ready to ship for its starting price of $650 at Adorama in the black color scheme and the silver color scheme! Free expedited shipping is included! If instead you prefer a previous generation model, getting reliable used (eg from places that test and stand behind their used products like KEH, B&H, Adorama) or manufacturer refurbished can save you money while lowering the risks of a eBay purchases from unreliable sellers. Which brings us to the Olympus Outlet store currently offering the E-M10 II body only in manufacturer refurbished condition for $300 with a 90-day Olympus USA warranty, or with the 14-42mm EZ lens for $430. On the other hand, if you prefer a “take pictures with” kit, you can get the Olympus E-M5 (first generation) with the 12-50mm EZ lens in manufacturer refurbished condition for $450 with free shipping at the Get Olympus USA store with a 90-day Olympus USA warranty. Contract that to getting the body only used starting at around $300 with a 180-day warranty through KEH ~ check our Used options post for more details. 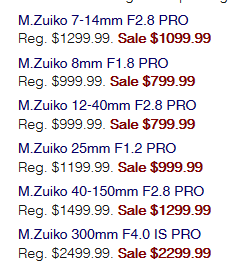 This too surfaced while price-checking the Get Olympus Refurbished Refill (I think that’s a new official term now). PS: I can’t post all 20+ new additions to the Get Olympus refurbished store, but if any others stand out in your opinion and would be of interest to other photographers, please let me know in the comments here or using the online contact form. … you can get the Olympus E-M5 body only in “Used – Excellent Plus” condition for $329 plus shipping (starts at around $8 and varies by zipcode) at Adorama USED. Used products at Adorama come with a 90-day warranty covered by Adorama, and a 30-day return policy. So when comparing used prices to other places, eg Amazon Warehouse Deals (AWD), keep in mind that most sellers at AWD offer zero warranty!